Case: Chicago Art and Theatre, Shakespeare: Will and George Come to Life. Will (Shakespeare) and George (Seurat) were alive and active in Chicago. Public participation in the arts has been in decline since 1982, including performance of art and adult art education. Bucking that trend, mobile marketing creativity created sold out performances in the Midwest. Combining an art museum and a theatre company in the same campaign was masterful and turned many a youthful head, and not just the 55+ market . The Art Institute of Chicago fans heads turned when they saw a “revised” version of their artwork on display. It was missing some key characters, who were live and in full costume, in the show. Ticket sales were declining for the play “Sunday in the Park with George,” and Chicagoans needed to be reminded about how art is transforming. 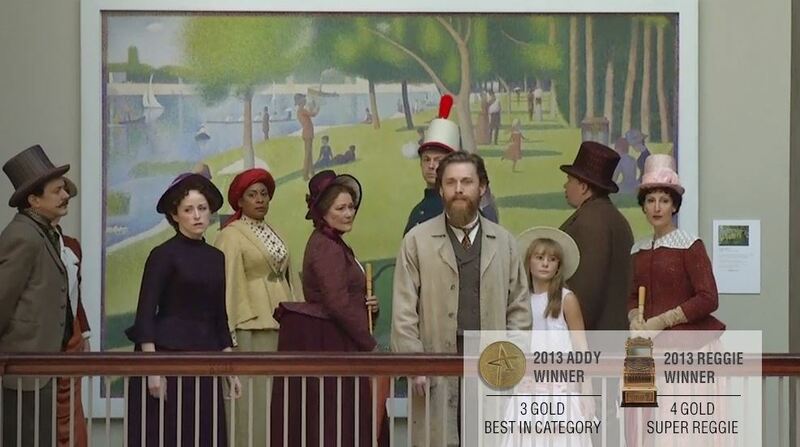 Chicago’s Shakespeare Theatre (CST) was able to convince the Art Institute of Chicago to switch the original George Seurat painting, A Sunday Afternoon on the Island of La Grande Jatte, which originally inspired the play at CST, for a fake that removed many of the main characters in the painting. They people were missing from the painting at the Art Institute, which was shocking. Museum goers and media found out what was going on when they saw CST cast members in their full costumes from the painting come to life outside of the painting and singing in the museum. Then they all walked over to the theatre to join the show, actors and art lovers alike. What was going on? The “people” in the park from the painting went to and performed in the play at CST, thus drawing attention to the performance and even selling out the theatre, making the run extend an extra week. The mobile marketing promotion was a text to win sweepstakes to get their own trip to La Grande Jatte in Paris. In addition, participants received a video of the performance at the Art Institute. The built in regular audience of those attending the Art Institute, the Number one attraction on Trip Advisor in Chicago, meant that many people attended already, and personal shares happened via social networks. After the video, viewers were invited to share with their social networks, too. Tickets to Sunday in the Park with George sold out quickly as the box office answered many mobile calls. The press received briefings, both local and national, and picked up on this quickly. The fake painting was later displayed at the Navy Pier in Chicago, part of an international art festival. More Chicagoans could now see the revised painting and share the story. More than eight million media impressions were gained from this event within 24 hours. Further, more than 17% of those who received the video via text were now opted in to receive future correspondence from CST, thus insuring a new database of theatre and arts champions. A theater that couldn’t fill seats had to extend the theatre event for another week. Art and theatre were seen in a totally new way, with mobile marketing. Discuss the effectiveness of mobile marketing bringing art to life by combining it with theatre. What other mobile marketing channels would you suggest that a campaign like this could use in today’s mobile enabled device environment? Make a list of ways that you could you combine two different types of organizations in order to create mobile marketing programs. Sources: “Shakespeare: Will and George Come to Life.” MMA Global http://www.mmaglobal.com/case-study-hub/case_studies/view/27197 accessed Dec 22, 2015. Please take a look at the internet sites we comply with, such as this one particular, because it represents our picks from the web.